Back we went. To the spot where our truck was parked. When the tears were flowing and I wished for what I couldn't do. Because sometimes things in life just don't go the way we'd hoped - no matter how hard we try. And then God gave me an unexpected gift right when I needed it most. The truck was parked at the home of a past El Salvadorian president. 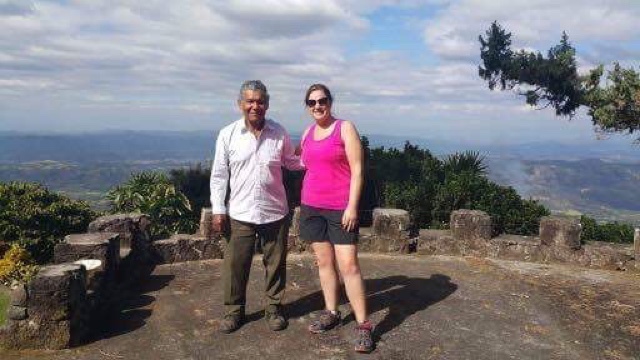 Up on the volcano in the middle of his coffee plantation. So while we ate our lunch I casually asked if there might be someone around who could tell us a little bit about the coffee and how it's grown. No one really knew, but a little while later I was introduced to a lovely elderly gentleman who had worked there for 60 years from the age of 13. He had so much to tell and it was so fascinating. And then, to my companions' surprise, he did something that apparently just doesn't happen... He opened a gate and led us into the president's gardens. Centuries old walkways and stairways. Manicured lawns and stunning floral gardens. All looking out to the valleys and hills around us. It was so beautiful and so unexpected and so lovely. I was thankful beyond what I could express. To our kind and generous guide, but mostly to Our God (my true Guide) - The One who is always there to show us the way. Even when it was not the way we had planned. I'm glad you're my friend:). Love these words you've written. Thanks for sharing this - God takes such tender care of us, doesn't He? Ok, you made me cry. Big shock, I know, but still...I felt your frustration and sadness and then how wonderful to see the gift given to you by our Abba...Daddy-God. He's so perfect. Happy for you, AP! Glad for that special gift from God to you. He is with us always, and nothing goes unnoticed by Him. (I prefer a garden over a mountain top anyways!) Thanks for sharing! Love you, my friend! Thanks for sharing this beautiful and real and transparent moment so openly! He's a good, good Father, isn't he?